I would struggle to choose my all time favourite flower but I do just love roses with a passion. 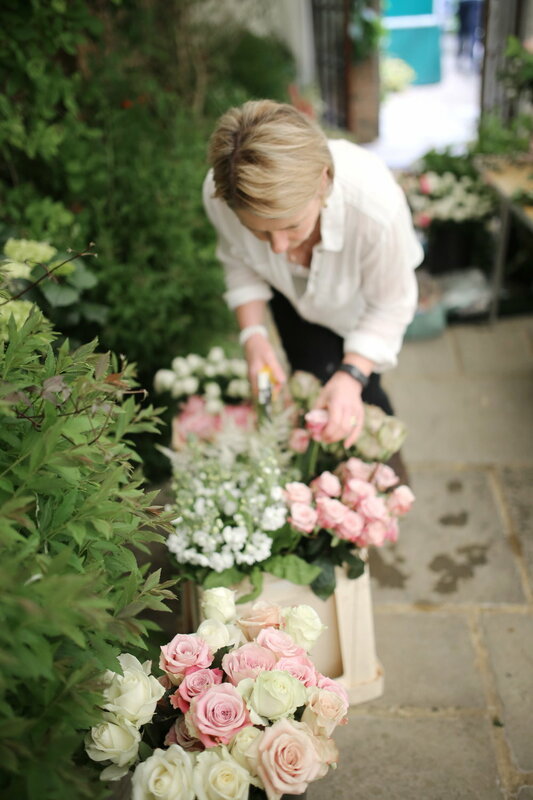 They are a joy to work with, from the large open headed garden roses to the tiny, delicate spray roses. With so many varieties to choose from in such a wide ranging colour palette, it's hard not to fall in love with them. It's astonishing to see how many roses are available as cut flowers and whilst I have a few firm favorites, I am still discovering new varieties that continue to blow me away. 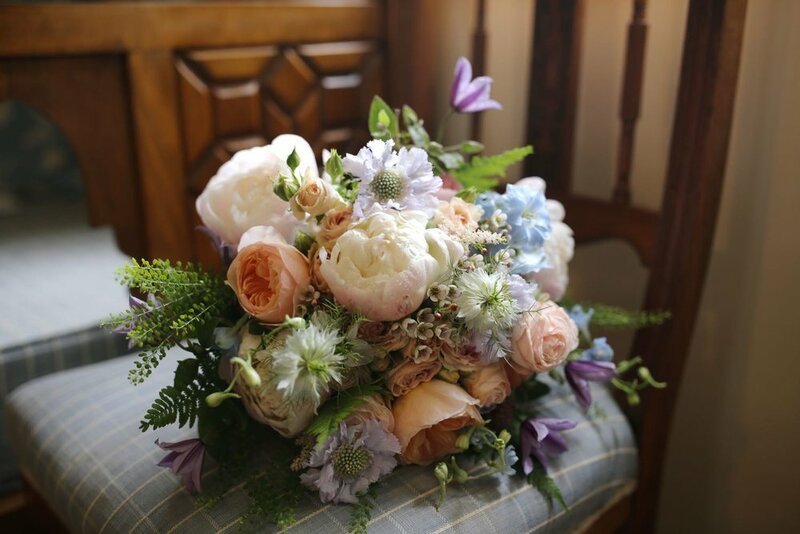 Not every wedding has to have roses but those that do will most certainly be transformed by these magical, romantic blooms. Aaah "Secret Love" roses, David Austin "Juliet" garden roses and one of my favorite bridal bouquets with some of the very best roses "Juliet", "Bombastic", & Garden "Romantic Antique", all in a soft, pastel peach/blush palette. "Garden Voyage" is another Ecuadorian rose similar in shape, size to the "Romantic Antique" but a soft, dusky pink colour; this sits alongside the beautiful "Bridal Pink Piano" spray rose with it's big blousy heads and delicate buds. 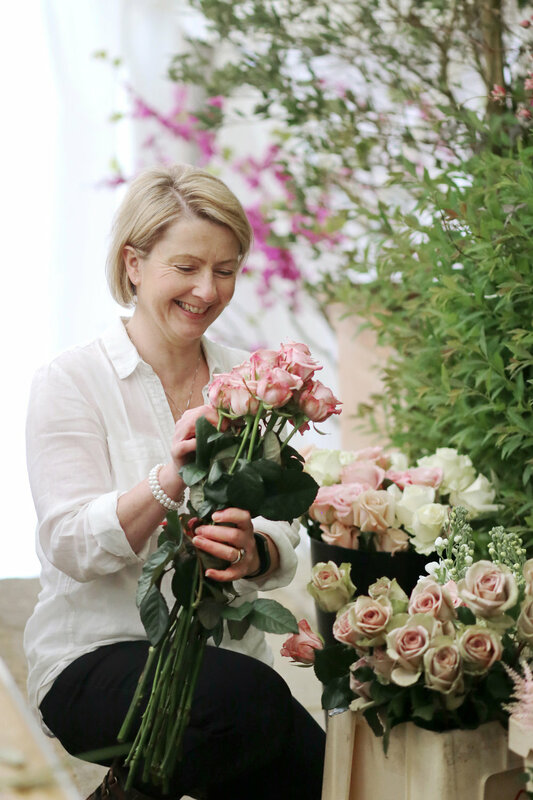 The gorgeous spray roses are "Bombastic", "Irishka", "Creamy Twister" & "Pink Lace"
It's all in the name! We have David Austin roses in our garden named after 3 of our children, we're just waiting for "George" to complete the set, that is a must surely? For a bright coral rose with lovely pink outer petals, you can't beat "Miss Piggy", I adore her! If you are looking for a soft, classic bridal palette, these are just perfect, "Avantique", "Sweet Peach" spray rose, "Maddison Park" spray rose, and one of my absolute favourites, "White O' Hara" which has the most divine fragrance ever. Whilst I have used some of my favorites here, there are also a few gorgeous antique roses, amongst them "Quicksand", "Amnesia", "Mentha" and "Upper Secret". Pride of place in this floral door wreath is the beautiful "Princess Charlene" garden rose which has a lovely subtle, fragrance. 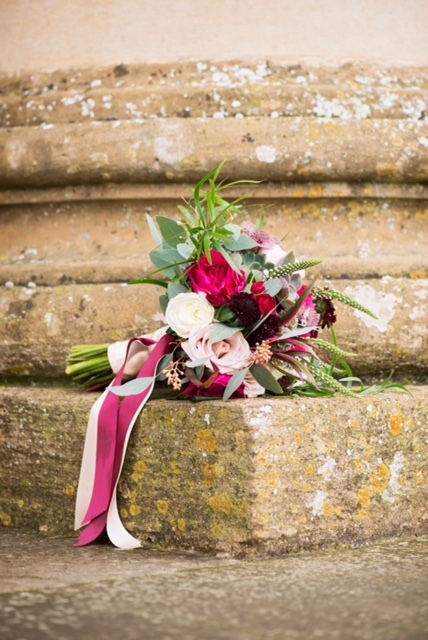 ...and in their perfect miniature form they make gorgeous buttonholes, corsages and hair combs, all the little details that could be so easily overlooked but not by us! and again here but with some bolder colours, the roses working their magic. According to my biggest fan, my youngest daughter Grace, I have to pin my sails to the mast and name my favorite rose but how can I possibly do that?? 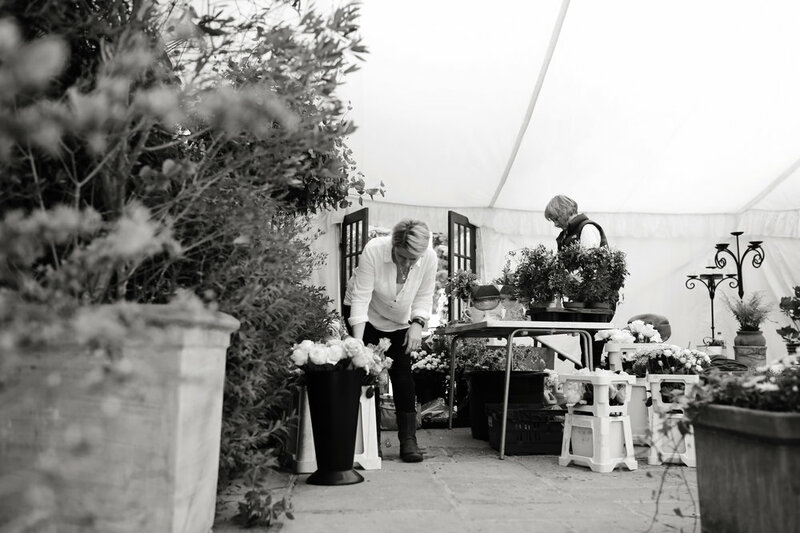 I have so enjoyed posting this blog and with many more weddings to come this year, I'm sure I will not be able to resist sharing my ongoing passion for roses but for now I hope you enjoy. It's been an exciting year, surrounded by gorgeous flowers but as always the highlight has been the people I have met along the way, special people who make the journey so much fun, and simply become good friends. We love the emergence of Spring, the optimism, and the promise of warmer, sunnier days. 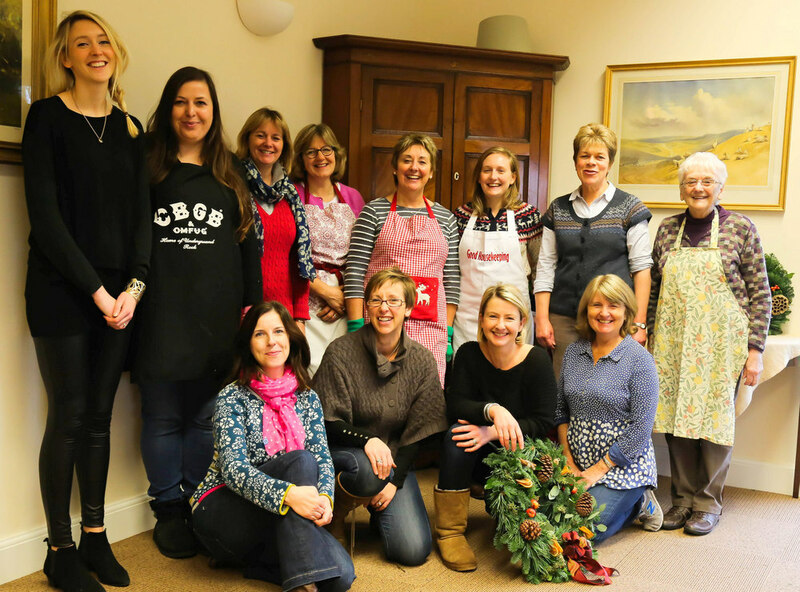 Here's a few highlights from our Spring Workshops courtesy of some very creative ladies, many of whom I owe enormous thanks for they keep coming back year after year. 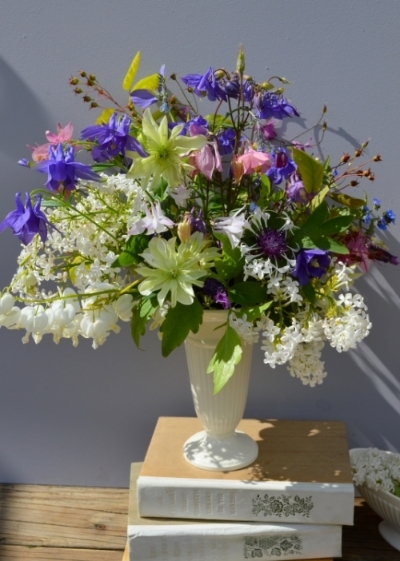 I love Spring flowers, especially Ranunculi, Paper White Narcissus and Muscari. 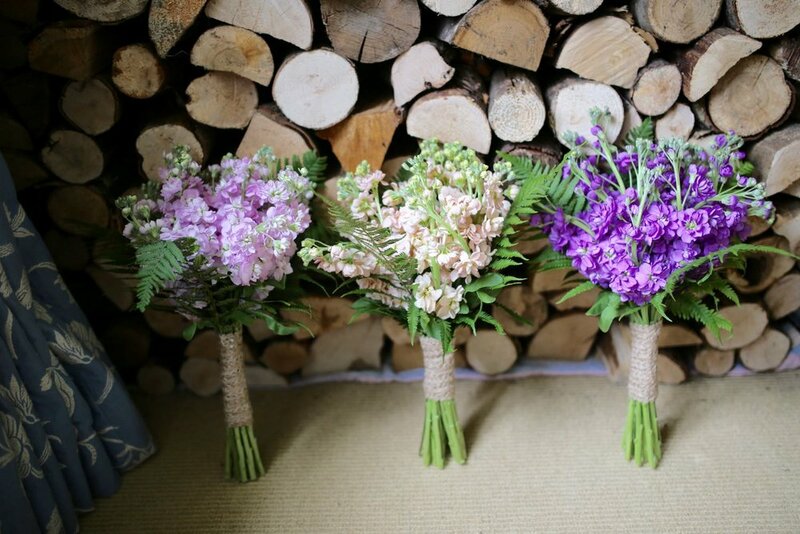 Combining these wonderful blooms can make a Spring wedding or celebration really special, here are a few of my favourites. It's not all about flowers, it's the images! Here was my challenge, how to capture images I would be proud to share? I invested in a new camera and booked onto one of Clare West's photography workshops. 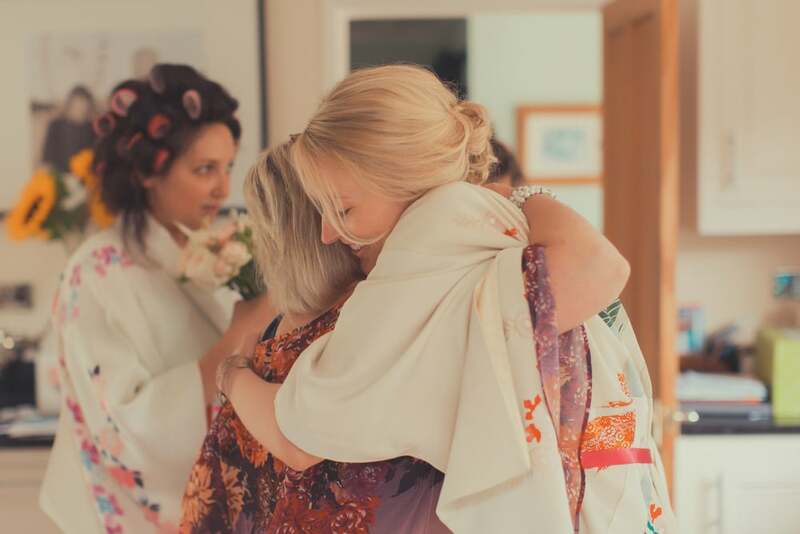 I first met Clare at one of my weddings last year and she was awesome! Here's a few of my photos, I have a long way to go but Clare was a great teacher, thank you so much, you've set me off on the right foot! Roses are a real passion of mine, especially the garden varieties so you will see them featured in many of my weddings, here are just a few of my favourite images. .. and then came Lyla! Shredding garden foliage; eating tomatoes, plums & apples from the garden, it's all in a day's work! If you come to visit, she will be here to welcome you, along with her wiser companion "Pippa" unless of course you tell me that dogs are not your cup of tea and then they will be totally discreet, but how could you resist! These are some of the moments I wouldn't miss! It's an utter joy and a privilege to be a part of such a precious day! We had the most fun working with so many talented wedding professionals in the magical setting of Lila's Wood. 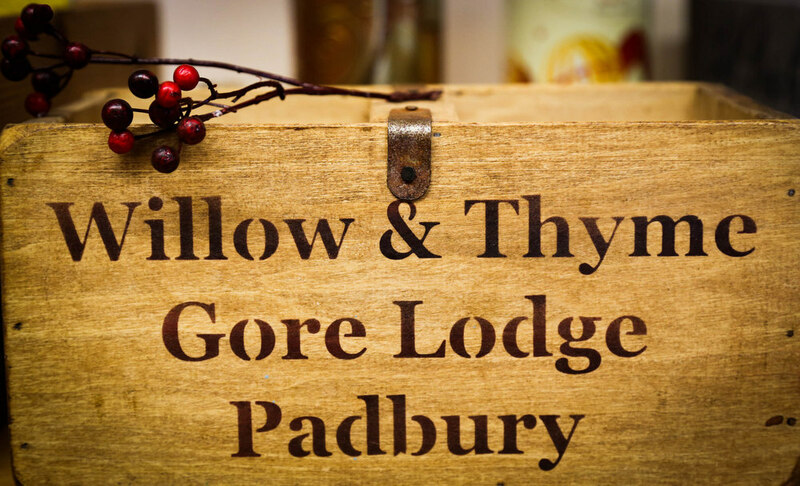 Thanks to Matt Bishop for the images, and Bochic Weddings & Events for organising and styling the whole shoot. Full credits and all images are on the Boho Weddings Blog. I love the whole run up to Christmas, as crazy as it is! 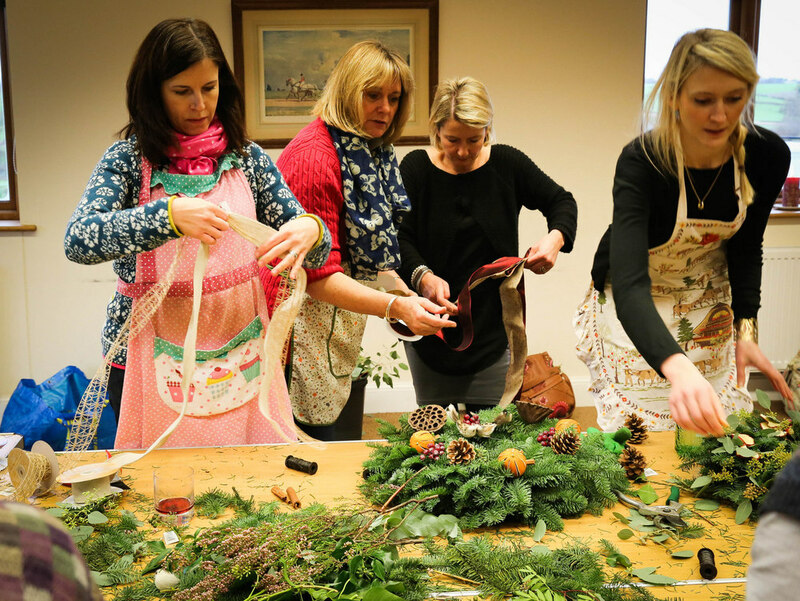 It is just wonderful to have the opportunity to inspire, guide and admire the festive creations that result from my workshops. Thank you to Fiona Scott for coming long with her camera and capturing some great shots. 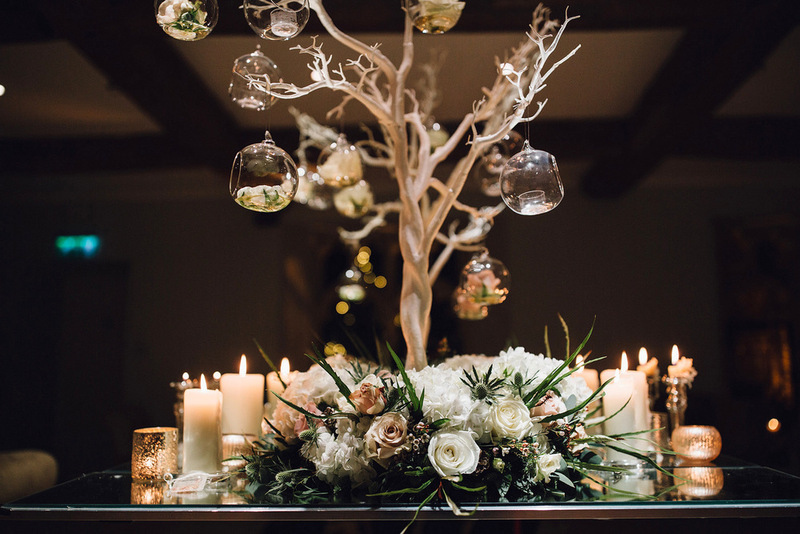 We ended the year with a magical, winter wedding at Notley Abbey, then headed back to finish our Christmas flower orders before getting ready for our family Christmas and a little more madness that I can only attribute to the 4 children, 2 dogs and 1 cat that provide me with endless fun! Thank you to Sam Docker for your awesome images. Thank you to everyone I had the pleasure of working with last year, I'm so lucky to have the support of such lovely people. Finally, I couldn't sign off without saying a huge congratulations to all my couples who married last year, I wish you every joy and happiness. It is so easy to feel a little sad as the summer slips away but I love the change of seasons and Autumn is no exception. Beautiful mornings with bright, blue skies and many garden favourites still in bloom, such as Dahlias, Japanese Anenomes, Salvia, Verbena, Sunflowers, Rudbeckia, and later flowering Roses. We can also still source gorgeous Dutch flowers with their extended growing season so if you prefer a softer palette, with a hint of autumn, panic not! 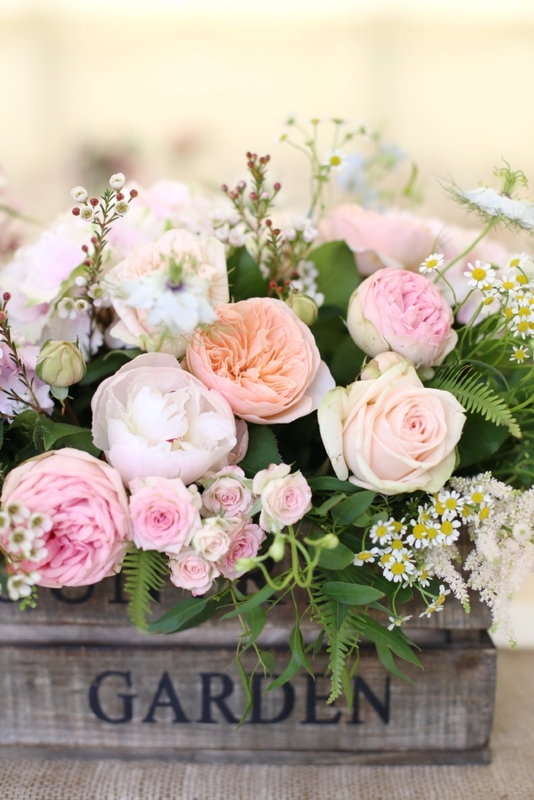 There are so many rose varieties available and mixed with autumnal berries and light foliage you can still create informal, romantic designs. What I most love is seeing the changes in the garden and hedgerow. The rosehips form and start to turn ruby red, the ivy produces beautiful berries, the crab apple trees are full of shiny little apples and seed heads develop such as fennel, poppy & lavender. 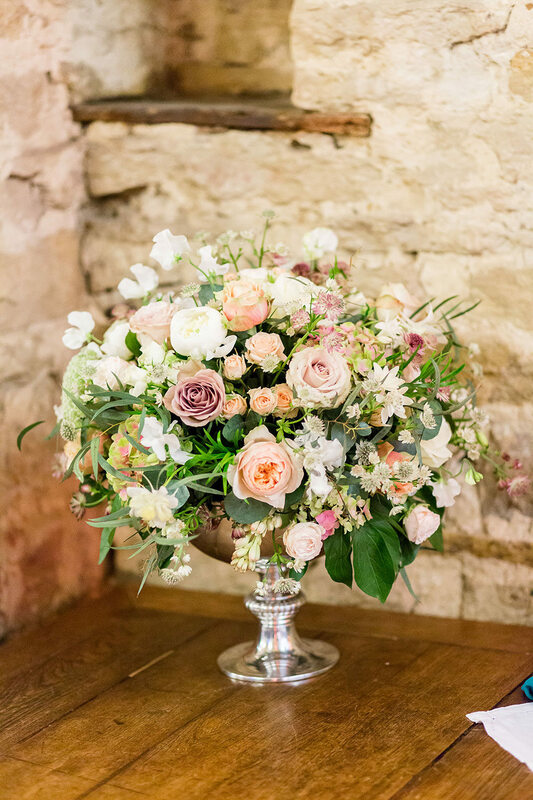 For me this is a wonderful opportunity to create exciting autumnal wedding flowers by adding a little touch of something special. The colour palette shifts in the autumn and it's a perfect opportunity to be a bit braver, head out into the sun and gather all you can to introduce some "sun" into your home for those days that are a little grey and gloomy. Rich, berry colours punctuated by softer peachy tones and good textural contrast for a lovely autumnal bouquet combining roses, ranunculi, anenomes, veronica & hypericum berries. 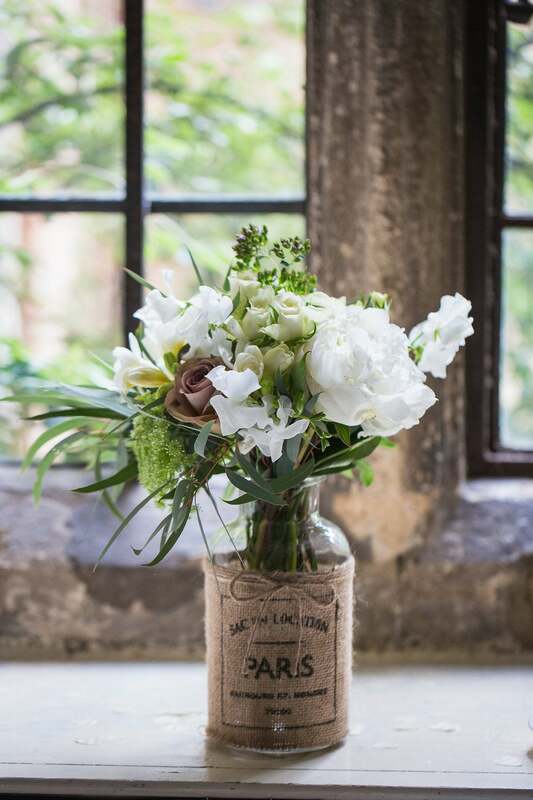 A collection of old bottles and bud vases with single stems can look stunning, less really is more for displaying your foraging finds whether it's a garden harvest or a collection of berries, hips and windfall stems from an autumn walk. A few examples of different autumnal colour palettes. Stronger, bolder colours combined with paler pinks and peaches, can work beautifully, again texture is key to creating a fabulous display. Fun Autumn flowers in a floral welly! Try having some fun by using unusual, quirky containers and see what's in your garden, go on, be brave, you can use so much; berries, seed heads, anything to create contrast in colour and texture. That old wooden trough lurking in the greenhouse; an old wine box from that wine club you never admit you're a member of or the Kilner jar you haven't yet filled with chutney; they are all just waiting to be given a new lease of life. 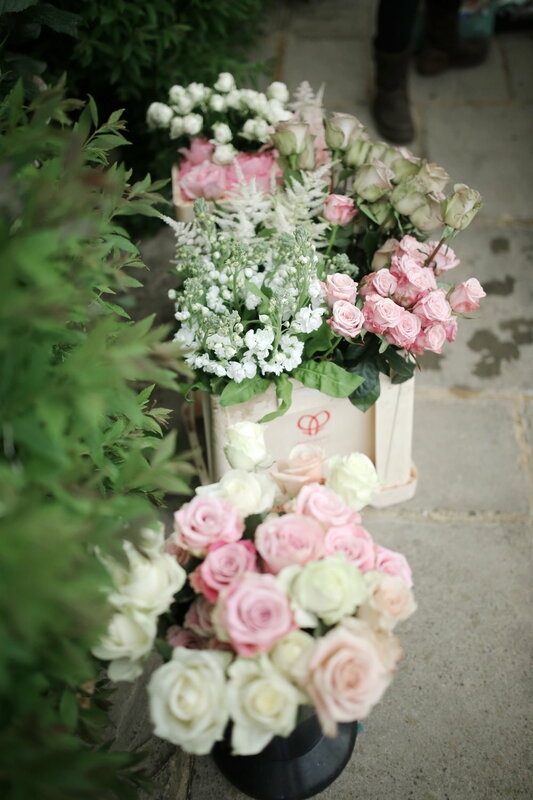 Miss Piggy roses, Lovely Roccoco spray roses, flowering mint, scabious seed heads, rose hips, brunia & silvery mimosa foliage complimented by the old grey wooden box. 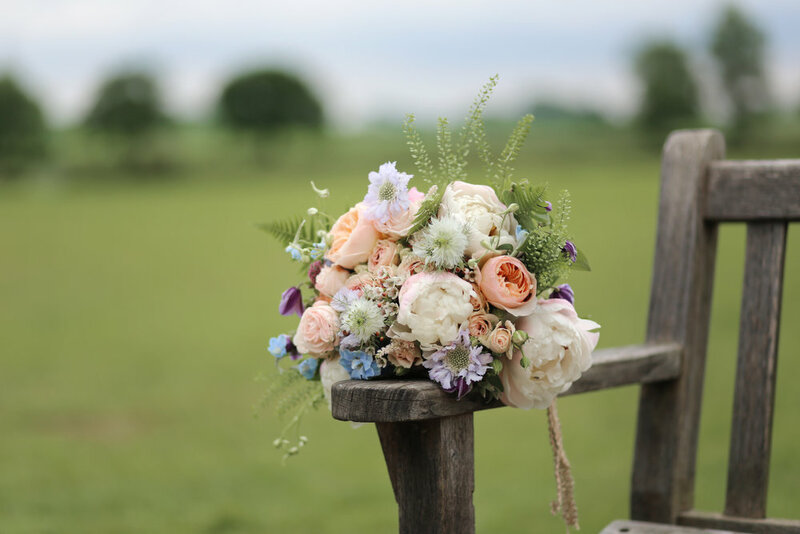 If there is a particular floral topic you would like to know more about in future blog posts, please let us know, we would love to hear from you.